Judging from early results in the Valley, the new Yanesha scorp Brian designed is being put into service with great gusto and impressive results. Yanesha artisans report that GreenWood's new scorp has many advantages over the more primitive adze they have been using for years. Chief among them is the improved control artisans exercise over a two-handed tool, which is pulled toward the body with a firmly guided stroke. 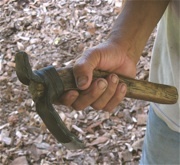 By contrast, the one-handed adze (shown in the photo below) requires a forceful freehand swing to remove material—a process both tiring and dangerous—and it leaves deep troughs that are tedious to smooth. The new GreenWood scorp requires very little finish sanding once it leaves Yanesha hands. 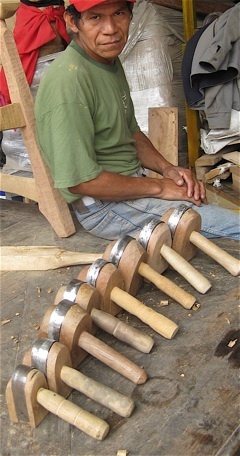 Tool handles are shaped by each artisan to fit his or her own grip and at least one Yanesha artisan, Esther Pascual from Laguna Raya, discovered she can work much more easily without tiring. Esther adjusted readily to the curve-bladed tool, making for more productive and safer employment in woodworking. The scorp is easy to sharpen with 150-grit sandpaper wrapped around a small stick and, according to group leader Belisario Ruiz, most of the artisans have already learned to adjust their tool to produce the best shaving. Brian's new scorp is particularly well suited to production of a wide range of Yanesha-sculpted woodenware. These include a 17-inch-diameter "Platter with Seeds" and a large rectangular trencher. 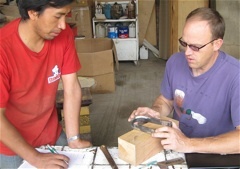 The tool is also employed for the primary hollowing steps and the exterior shaping of rectangular bowls. For larger shapes (like the 24-inch bowl shown in the photo below), Yanesha artisans typically excavate the bulk of the wood with the curved hand adze, then smooth the interior walls with the new GreenWood-designed scorp. Yanesha products are finished and sold by GreenWood's local NGO partner, PaTS (Partnerships and Technology for Sustainability), based in Lima, Peru, and distributed in North America by Montes Doggett, Greensboro, North Carolina. GreenWood's Yanesha training is made possible by the generous support of the Blue Moon Fund.